How to decorate a beach wedding is a balance between creating a stunning location and not spoiling what nature provided. Beaches are naturally romantic places, from walking along the beach and watching the sunset to wrapped up warm walking along a stormy winter beach, they are very special places. 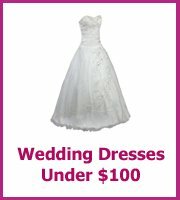 So it's no wonder that you have chosen to get married at the beach or at least have a beach themed wedding. 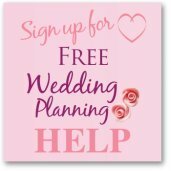 When you choose your beach wedding decorations there will be lots of areas of your wedding that you will want to include. You will want to have a designated area for your guests and yourselves as you may find that the sand will be too soft to have lots of chairs. For older guests you may want to provide deckchairs and for very young guests blankets for them to sit on. You could use shells to mark an aisle in the sand and brighten them up with flowers - make sure you push the stems in so that they don't blow away. 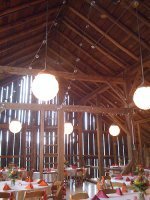 If your ceremony is at dusk then you could mark the aisle with tiki torches or provide guests with lanterns to hold. If you think that it might rain you could provide your guests with your wedding color umbrellas and these could be used as your wedding favor as well. Check out ebay and overstock, plus your local dollar stores to find a bargain on the umbrellas. You could then have those little drinks umbrellas in the reception drink to add to the theme! If you know a local sand sculpturer or local art student why not ask if they are able to design something for the ceremony - this may cost more than you want to spend but a definate wow factor! 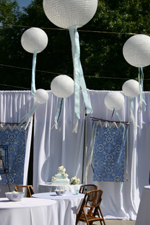 A beach theme for your wedding reception is a popular choice and therefore there are lots of beach wedding decorations available from craft stores. 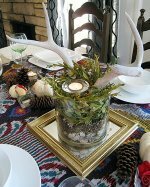 A beautiful beach centerpiece idea is to have a glass hurricane lamp that you have filled the base with a layer of sand and then place a pillar candle surrounded by shells on top, this is an easy one to recreate and if you can't find cheap glass hurricane lamps then use big glass jars instead. Beach wedding favors are available as flipflops, shell soaps, mini messages in a bottle, shell chocolates - love the Belgium white and dark chocolate ones, and mini beach huts. A make your own beach placecard that fits the theme is to paint a pebble with your guests name or initials - this will look great at each plce setting. The warning is it is very time consuming! Use a white or silver pen instead of paint for ease and speed. Colors for a beach theme can be turquoise and coral, navy and pale yellow or creams and pale blue. Take a look at your beach and choose the colors from there. Don't forget to add your beach theme to your invitations to help set the theme for your beautiful wedding. Just because you are having a beach wedding you don't have to have beach decorations everywhere. Instead why not look at decorations that will compliment the beach setting. This you could do with flowers and lanterns. 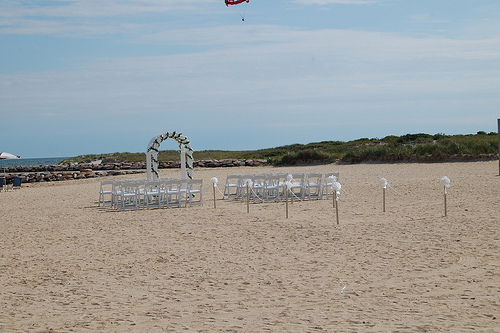 If your reception is to be outside on the beach you will want everything you to decorate with to be quite weighty - otherwise they might just blow away! Although one decoration that looks lovely and does blow away is to have rose petals to mark your aisle for your ceremony.